Moms on the go are always looking for products that are convenient for their busy lifestyles. This Christmas season Po Campo offers the gift of style and convenience with their collection of trendy bicycle bags and accessories. Po Campo line of bags and accessories was started in 2009 by Chicago designer Maria Boustead. Boustead couldn’t find a bicycle bag that she liked so she decided to make them herself. 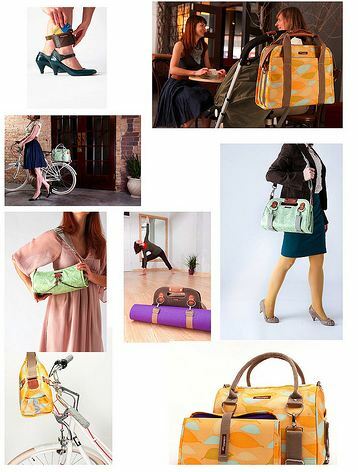 Po Campo Bags are designed to attach to bicycles, luggage, strollers or yoga bags. Each bag is unique to match any style or personality. They have everything from sturdy panniers for those commuting to work by bicycle to beautiful satchels great for shopping and running to the market. I absolutely love their Armitage Satchel which clips easily to my stroller. The bag is made out of study material and has plenty of room for diapers, wipes, snacks for my kids, my wallet and a few small personal items. You can also use the Armitage Satchel as a bicycle bag or tote and it also comes with a matching changing pad for families on the move. Po Campo bicycle bags beautifully blend style and functionality. The bright, playful designs add effortless style to any bike and the proprietary CONNECT™ system allows cyclists to detach the bag and use it as a briefcase, grocery bag or purse on the go! Po Campo bicycle bags are truly versatile, with capabilities to hold a yoga mat and with enough space to hold ipads, work documents and whatever else the day or night requires. You can purchase Po Campo bags at your local REI or online at PoCampo.com. You can also connect with Po Campo on Facebook, Twitter, Pinterest, and YouTube. Related What Does it Take to Have a Great Blog? *Disclosure: I received a Po Campo Armitage Satchel in exchange for this review. All opinions are accurate and 100% mine. How to be Grateful During the Holidays — and All Year Long!